Okay, so I've reviewed some Sony Ericsson phones before but I never really owned them. The Sony Ericsson W595 is technically my first walkman phone. Here's a closer look at it. The Sony Ericsson W595 has a chunky design. It has a plastic materials though doesn't feel cheap except for the battery cover which I REALLY, REALLY hate. The back/battery cover is made of thin, plastic material, it's very hard to open and there's a high chance that it would break if you're not gentle enough. But then again, if you are too gentle, you probably wouldn't open the battery cover which is a bad news for those who would want to swap sims or take out the M2 card. There have been several reports of the battery cover being broken from some W595 users. The shiny border around the W595 makes the design more attractive especially the white version. On the left side is their proprietary connection and on the right the dedicated Walkman button and volume control. There's not much to say about the Sony Ericsson W595. It's not attention grabbing or anything but the white one does look “cute”. So, since the W595 is a walkman phone, it should be a good music phone right? Well, I'm a bit on the middle about this one. The loudspeaker does a good job of playing back jazz music or any audio with a lot of bass but acoustics sound tinny. The loudspeaker on my Omnia sounds much better which is not good news for Sony Ericsson. The phone doesn't have a 3.5mm headset jack on the phone itself but there's an adapter which you can insert two 3.5mm headset jacks to. I think Sony calls this technology, the Share Music feature. The provided headset is crap so you have to replace it with your own. Using a higher end headset or a stereo Bluetooth headset, it is now clear that the W595 is indeed a Walkman phone. Playback is GREAT! And the MegaBass feature further enhances audio quality. There's also a lot of music options such as SenseMe, Shake Control and TrackID. The 45MB internal memory on this device is a joke but Sony rectified that by adding a 2GB M2 card with the package. The user interface didn't change much on the W595, you still get animated themes and the media button will still bring up the Playstation-like menu. 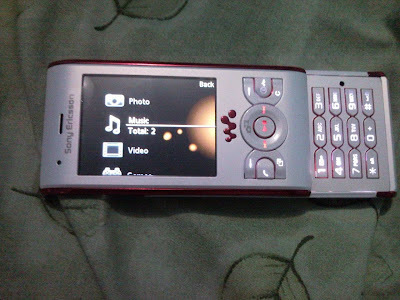 I honestly love the themes of Sony Ericsson. They're cute and easy on the eyes. The 2.2 inch QVGA screen of the device enhances the rich and colorful themes of Sony. The W595 has a built in accelerometer which automatically changes the screen from landscape to portrait mode whenever you tilt your phone. The accelerometer on this device has greatly improved, I was expecting to see a lag but the transition from portrait to landscape is smooth and fast. What I don't like about the interface is when it comes to messaging. Text input is SLOWWWW. Or maybe it was because I got so used to the one button one text input of QWERTY keypads compared with phone pads. 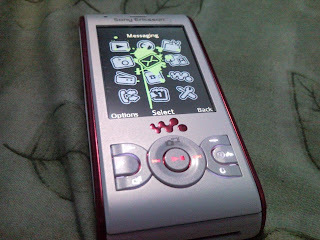 But then again, compared with the text input of my old Motorola and Nokia, the W595 is slow. I also hate the backlight. Yes, it's a power saving option wherein the light would dim if you're in a brightly lit area but when you're texting and the light suddenly dims, it's not really good for the eyes. Also, the keypad is rather small and cramped so texting is also hard. Wow, I never thought QWERTY keypads would grow on me. I used to be a phone pad girl. The Sony Ericsson W595 is 3G/HSDPA capable and has the Access NetFront Browser. The Browser is pretty decent, offering a finger-mouse, fast rendering of webpages and a copy and paste function. I don't know whether it's a network problem or phone manufacturer but when I use my Sony Ericsson W595 as a modem, it seems that my internet conneciton is much faster compared with my Omnia. Maybe it's the signal, the W595 gets stronger HSDPA signal than my Omnia. No, YouTube on the browser is not supported but there's an included YouTube and Google Apps application on this device. There's a lot more application on the W595 compared to games though you can download some games at the Sony Ericsson website using your browser. I love the applications. I can't say the same thing about the junk applications that Sony bundles with their VAIO but the ones on the W595 are a treat. I love Music DJ, PhotoDJ, and that comic strip application. The Sony Ericsson W595 has a 3.2 megapixel camera and no autofocus. Picture quality is good when taking outdoors shot, passable when taking indoor shots. Will display sample images tomorrow. The Sony Ericsson W595 is not really a ground breaking phone. If you're choosing a free phone to go with your contract, this would be a good phone choice. If you're looking for an unlocked music phone, not really a good value for your money unless you get it free with a contract. There are a lot more good unlocked phones out there that would be worthy of your money. The W760i, with GPS and WiFi is a better choice. Got this off 3 for free. I wonder if there's any difference in the interface? What kind of games does yours have? k. have on three. a. signal strength is really bad. b. in the first two weeks it went into repair twice on software problems... halfway into my contract and the screen light wont work. This site is very good site. It's Provided me a lot's of information and new type information cute cell phone accessories related.